With the majority of the league more than halfway through the Big 12 slate, it seems like a good time to look at what each conference title contender has left on its plate. I took a look at the average opponent KenPom rating for the league’s top-five teams and included some of my own analysis as well. We’ll start with Iowa State because this is an Iowa State website and, in case you didn’t hear, they are projected to win the league by KenPom. I was somewhat surprised to see the Cyclones have the highest remaining average opponent KenPom rating, but that is impacted by the fact they have already played Oklahoma State (No. 100 on KenPom) twice and have just one game left against No. 104 West Virginia. 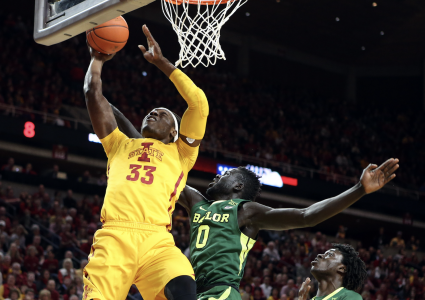 The Cyclones have three games left to play against the league’s top-five teams with two of them coming in Hilton Coliseum. 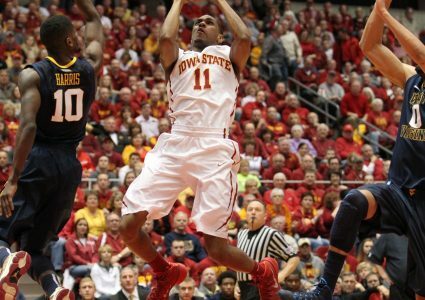 Iowa State is currently favored in the rest of its regular-season games by KenPom and is projected to win the conference with a 12-6 record. Iowa State’s road trip to Manhattan a week from Saturday to take on Kansas State, the contest in Fort Worth against TCU and the trip to Austin for a date with Texas are currently slated as the biggest toss-up games by Pomeroy’s computers. 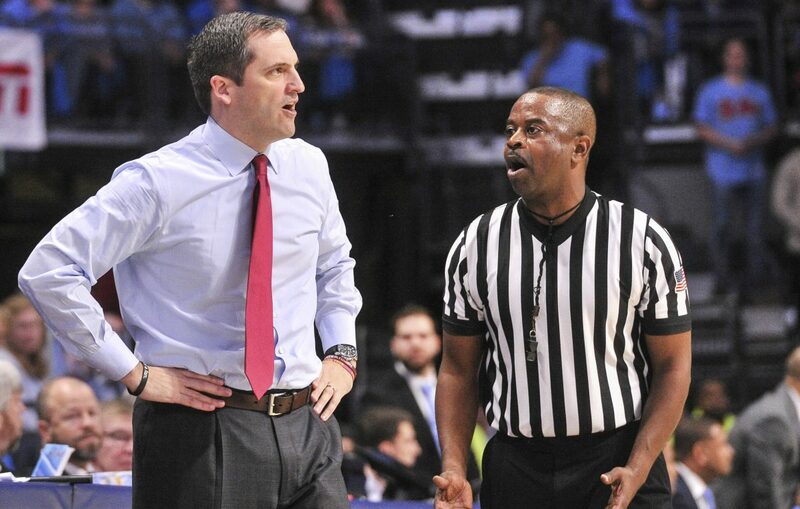 Scott Drew’s Bears have been the league’s biggest surprise this season and they also seem like the most likely team to fade from the race in the coming weeks. They have five games remaining against the league’s top-five teams with four of those coming away from Waco, including a trip to Hilton Coliseum on Feb. 19. Baylor also has to play Texas twice still with the first one coming Wednesday night in Austin, a projected 67-64 loss. Their average was drug down by having one game apiece left with West Virginia and Oklahoma State, but they have a gauntlet of a road schedule left with trips to Lubbock, Ames, Manhattan and Lawrence all remaining. Kansas State’s win in Ames continues to look more and more important to the league race. It also already went on the road to Lubbock as well as hosting the Red Raiders so Bruce Weber’s squad is left with four games against the league’s top-five, two of them coming on the road. They also have to go on the road to Texas and TCU which are both currently projected as losses. 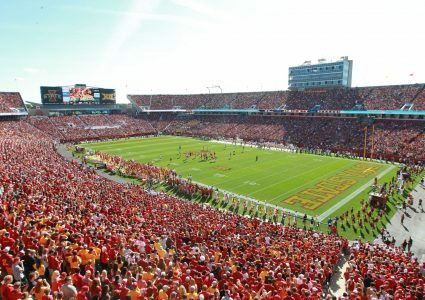 The home game next Saturday against the Cyclones is going to be HUGE as far as the league race and they’ll be coming off two difficult road tests against Baylor on Saturday and Texas next Tuesday. As of now, the Red Raiders are projected to win the rest of their games besides one, the regular-season finale in Ames. That game doubles as the team’s only remaining road contest against the league’s top-five. Texas Tech still has to host Kansas and Baylor, leaving it with three games against Big 12 contenders. Road contests against Oklahoma and TCU are both expected to be essentially toss-ups though. After Tuesday night’s loss in Manhattan, the Jayhawks have three games remaining against the Big 12’s top-five with only a trip to Lubbock on the road. But, when you’re 1-6 in true road games after the first week in February, it is safe to say no road contest will be a guarantee for Bill Self’s squad. Road trips to Norman and Fort Worth will be toss-ups and Stillwater has proven to be formidable for better Kansas teams in the past. The Jayhawks’ average opponent rating is brought down by two games left with Oklahoma State and a home date with West Virginia next Saturday.